Books in the Santo Domingo collection are predominantly in English and French, per the collecting habits of Julio Mario Santo Domingo himself. Today we have an exception to this rule: Sexuální nocturno, by the avant-garde Czech author Vítězslav Nezval (1900-1958). 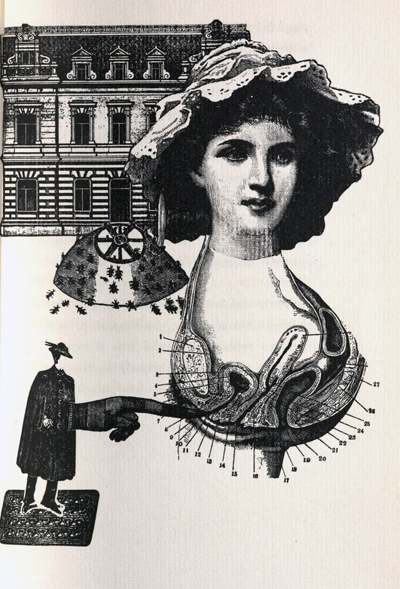 Printed in a limited run of 137 copies, this edition is illustrated with a series of psychosexual black and white collages by surrealist artist Jindřich Štyrský (1899-1942), who also typeset and published the book. Sexuální nocturno. Prague: J. Štyrský, 1931. PG5038.N47S49 1931.